A while ago I wrote a post for the 2018 AtoZ Challenge on Visualising and the concept of a Vision Board - something I'd thought of making at various times in my life, but have never actually done anything about. Donna from Retirement Reflections (who is my next Social Saturday guest) suggested I write a post on the process when I completed it. Well! That certainly upped the ante and I felt that I should put my glue stick and scissors to work and see what I came up with and this post is the end result. Jennifer from Unfold and Begin wrote a great post on why Vision Boards don't work - basically a Vision Board won't do the work for you - it's up to you to look at all those pretty pictures and work out how you're going to make them happen (don't sit there waiting for life to happen to you!) Jennifer does admit that her most popular posts have been about creating these boards, but she just wanted to emphasise that they're a tool - not a magic bullet. Whenever there's mention of Vision Boards, I always think of this magnetic pin-up board I have in my "office" at home. It is more of a Memory Board than a Vision Board though. It contains photos from when our children were young and has little snapshots of holidays, events, weddings and our gorgeous grandbaby. A true Vision Board has pictures that inspire you to look at your life and see what you'd like to focus on and what you'd like to achieve. I've never done one and when I thought about putting one together, I realized I didn't have any magazines to cut up and it seemed pointless printing off pictures to cut up and glue back down (I'm not a scrapbooker and have never understood the concept of all that cutting and glue-ing). 1. Relax - this is to remind me to be more mindful, to not worry and stress, to let things be. 3. Tai Chi - a few years ago I learned Tai Chi and then let it all go. I've discovered a class nearby and have plans on re-starting because it is such a mindful practice. 4. Work drama has been a bit of an issue for me in the last couple of years - I've addressed it and I'm monitoring myself and my work environment to avoid getting stressed again. 5. Getting fitter and healthier is something that I'm always working at improving on - there are so many Midlife bloggers who are doing amazing stuff in this area so I'm aiming at improving in both areas. 6. Make some money blogging - not a high priority because my blog costs me nothing - but it might be nice to look into some of the offers that turn up in my email inbox. 7. Study online - this one is a definite goal - I've found some free online courses and I'm going to tackle one in the very near future. 8. Smile! Life is wonderful and I want to focus on the good, be grateful for all that I have, appreciate the people who love me and just be happy and content - which will make me smile! Are you a fan of Vision Boards? Have you ever created one? I'm still not completely sold on the idea but it was a fun challenge to attempt. Have I inspired you? I'm the same Yam - it was an interesting project to tackle, but I don't have the visual aspect to creativity that you need to do it well - probably why my photographs are in an album and not in a decorated scrapbooked display! I've had a vision board for about 15 years Leanne and love looking back at what I've had on there over the years. Mine started as a vision of what I wanted to achieve through travel and fitness but has morphed into a combo of your #1 & #2. I used to have it above my desk in my office where I worked and it is a constant reminder of our dreams and goals. I love looking at my Memory board Sue - it's such a reminder of all the special parts of life - the Vision Board has kind of kicked me into getting a move on with a couple of things I've been dithering over - which is a good thing indeed! Yes you have definitely inspired me Leanne. Years ago I always had a vision board. An actual one not digital. I am definitely going to make a digital one now that you've prompted me. I liked doing the digital one because there's so many pictures to choose from and you find a picture to match your vision rather than trying to get your vision to fit a certain magazine picture - I hope you get around to doing one Jennifer. You're such a visual person Jodie so I can see you making a Vision Board work really well - I bet you had a million fashion pics from those magazines! I can see the appeal & have often thought 'yeah, I should do that.' Have I? Nope. I forget that I should...& then if I did I'd probably forget to look at it. I am, however, going to have a go at a digital board...& remember to look at it. It sounds like we've hit a similar stage of the Midlife journey Min - ready for a bit of a change in routine and willing to step a little bit out of our comfort zones - I've picked an online writing course to have a go at - so far it's been fun and fairly cruisy and I should make it to the end without too much trouble. Thanks for introducing this idea of Visual Board, Leanne. I haven't thought in this direction till now. Should give it a shot, some day. It might give you some fresh ideas for your blog Pradeep - I'm always looking for inspiration and mine helped me decide which areas were important to me right now. Wow, this is brilliant! Off to start one today! Have shared because it needs sharing. Good on you AJ - I'd love to see what you come up with - I bet it'd be full of interesting reading material and deep, dark characters! I love the idea, Leanne, but I just know I daren't get into anything else, creative or not! It's fun to dream about though! I once did one for a novel I was writing (that never got published). It was great fun and very inspiring, but I just don't have the time to even consider it now. Enjoy! Got a book you need to market? Maybe you need a Street Team! I think you have more than enough on your plate atm Shirley - I am amazed that you are managing to juggle so many balls all at once! Maybe it can be on your one day plan and wait til some of the books in your head are finished? I have had one for years, but took it down about a year ago. I needed the board for something else!!! I think it's time to put it back up. That's probably also a good practice (take down and rebuild), to keep the "vision" fresh. :) Thanks for the reminder! Love the idea of vision boards. You are so creative Leanne - I love the ones you've compiled. I just never seem to have the time, but I'm guessing my time management skills leave a lot to be desired. I really want to put together a family memory board for my office sometime soon. I find that I don't look in my photo albums much Jo - so having the board up there where I see it several times a week just gives me happy thoughts and a smile. The vision board was an interesting exercise - I might do another one when I tick off all the things on the current one! OooH! I definitely need to do this. Now what to put on it . . . I wondered what to put on mine too Diane - it comes to you as you go along - and it will be nice to tick a few off later in the year. I'm a believer in vision boards and have blogged about mine (attempting to connect last one below). I love your memory board as well. There's a few different beliefs about visualizing... and I think you articulated one in a comment: finding pictures to reflect what you want to to "say". This is a great approach and visualizes what's on your mind... very rationally and logically. The other approach is to use the magazine approach and think about a question ("what do I want my 2018 year to be like?") and then do the rip out, cut and paste. I buy magazines at half-price book place or keep a few around when I know I'm going to be doing a board. The second approach actually uses your unconscious brain... it's not always rational and requires you to step back at the end and see what you're trying to tell yourself. It's been more insightful for me to do it that way. And it does not require "creativity" or skill (cutting and pasting is kindergarten skill set) ... you don't need to match any ideas to pictures, you look at the board at the end and just tell its story..."My 2018 will be...". I've seen things in my boards that I didn't realize I wanted...but then realized I did. My subconscious brain was letting me know! I really like that second approach Pat and I think I'll give it a try when I've got a few magazines to tear up - it's more free range and creative and the pictures come before the conscious thought process - it's a very interesting concept! Hi Kathy - I'm thinking I might have a go at doing one like Pat suggested in the comment above yours - just randomly choosing pictures that have a pull or attraction and see how they resonate with the future directions I'm pondering? Hi, Leanne - Thank you for the shout-out. I look forward to Guest Hosting on your site shortly. It's so cool that you will be pursuing on-line courses. I would love for you to share some of your reflections from your courses on your blog. (Okay, okay, I can hear you all of the way from Australia saying, "There Donna goes again suggesting more work for me!" But you must admit, it would make great blogging material (like Deb Harris's blog reflections from her Food Discussion Group...which I also love)! You're right Donna - and I am thinking about it - or even just about what it's like to go back into doing a bit of online study after being study-free for a long time. I did do a Certificate IV fifteen years ago and this will be my next foray into doing something to make my brain think a bit harder. I also tried my hand at essay writing recently and that is getting a blog post in honour of the occasion! 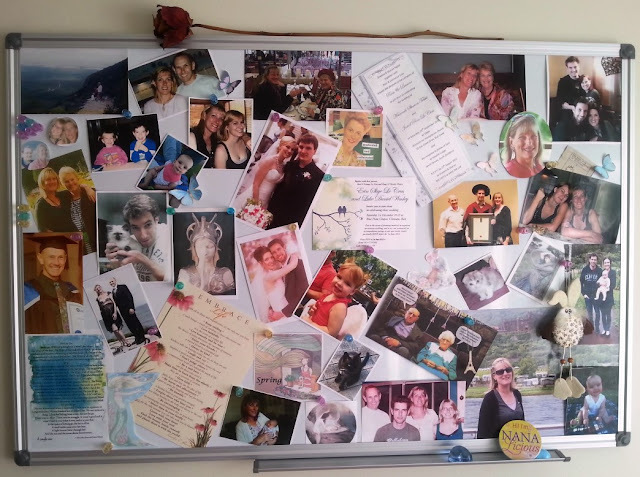 That's what my Memory Board is Janet - lots of people I love, and things that are pretty or remind me of something. I'm giving a different part of my brain some excercise with my Vision Board this time. Although your first "vision board" may not be technically so, I still think it looks great and it's nice to have up all those meaningful photos reminding you of various times in your life! I know what you mean about the tee shirt Hannah - surely any awesome Nan would want it in a colour that reflects her fabulousness! And yes, I love that board in my "office" it makes me smile every time I walk past it or when I'm sitting in there. Except it's getting overtaken with a large number of grandbaby pics! 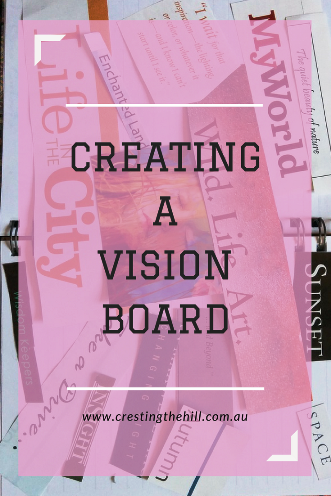 Brilliant idea - to create a Vision Board in Word! While I do enjoy scrapbooking family photos, I do not read magazines and cannot bring myself to buy several just to cut them up. But this I can do ... and as you say, I can sharpen my PhotoShop skills (especially using the lasso tool to cut away unnecessary backgrounds). I had to remember how to turn a picture at an angle and how to overlap them - all things my poor brain had to figure out - but that's good for keeping me on the ball, and I was happy with my end result - but eight was enough pics for me! 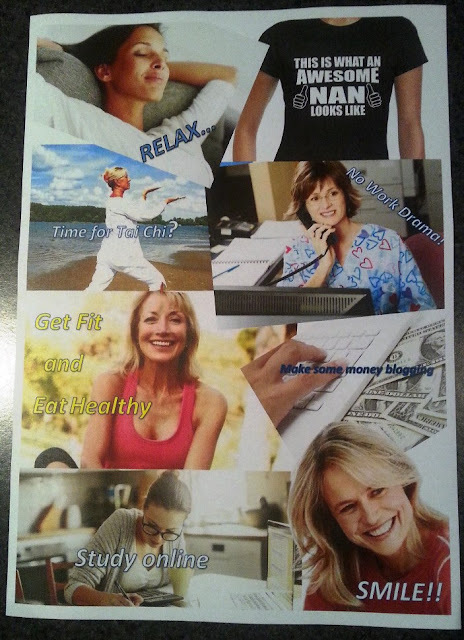 I think vision boards are helpful because they keep your ideas out in front of you. Of course you have to actually do the work! I keep a vision notebook, which I've head for years and I paste things into it that inspire me or that I want to have or do. When I look through it, which I don't do every day, I am often surprised by the things that have come into being. I like the idea of a Vision Notebook Michele - I saw one lady's book of little scraps of memories and things that inspired her - each page had something interesting added to it. I've started putting the occasional photo into my journal and might have to take that up a notch when I start the new one that's waiting for me. I've made vision cards every year now for the past four years or so. They are marvelous, but I agree they are just a tool. Just putting the pictures down won't make things happen but it is amazing how things "happen" when your intentions are out there. It is June and that is when I typically go over the cards I made at the beginning of the year to see how I'm progressing. Thanks for reminding me about that! I am one of those scrapbookers so the cutting and gluing are all me! Kudos to you for manipulating it on the computer, I struggle with that. I think doing it on a regular small scale is a great idea Janet - I wish I was a bit more crafty and thought to do things like this more often. It's really not hard and it's been an interesting tool to see what is important to me and what's in my head atm. I'm not huge on vision boards but do visualization through writing from time to time. The other thing I've found enlightening is trying to draw a Mandala. The act of drawing with light and shadow somehow helps me tap into unrealized hopes and dreams. Also, I also enjoy TaiChi but find that I currently resist joining groups so I try to incorporate different elements of TaiChi into my personal meditative practices and exercise routines. The Tai Chi instructor I found near us uses a completely different style to the one I'd learned years ago Janet. I didn't realize they could be so different and yet still give the same sense of being in tune with your body and moving in a fluid way. I want to get to a point where I can know the moves off by heart because then they could be part of my morning routine. I wrote a lot about vision boards in your A-Z post and on my site - I use them every year and find them invaluable. Rather than repeat all that here, I want to comment on the monetizing your blog thing. Be careful, my friend. Be very, very careful. Before I started my blog, I did a ton of research as is my wont. I even paid to join an exclusive online sequence of courses run by a group called Smart Bloggers Only. Their definition of Smart turned out to be bloggers who monetize - they couldn't see any other purpose for blogging. Anyway, I have all kinds of info I'm happy to share with you if you decide you want to pursue this but, for me, I went down that rabbit hole for a while and almost disappeared. No matter whose research I read, every action was supposed to further the goal of making money. It can be very, very easy to tweak choices and decisions just that little bit to satisfy someone else's agenda and, in the process, to lose your way. I'm speaking only for myself - I almost didn't start the blog because of this - and perhaps your story will be different because your blog is well established. But I thought it worth passing along, either as a cautionary tale or so you know that I've got good stuff about monetizing if you decide you want it. One last thing about this - if you go the route of ads, please, please don't let them interject them in your posts. I love your blog and would probably stay with it because I do and because it's by you, but my common practice is to look at a new blog, see an ad in the middle of the post and never look at that blog again. I become immediately suspicious of the blogger's intention and of her content, and resent being used in this way. Eesh. You've obviously and I know quite unintentionally hit a nerve. I think you've also given me the topic for an upcoming post. I clearly need to work this one out and we both know that writing is a great way to do that. Thanks, Leanne. Hi Karen, I won't be going down the monetizing rabbit hole - I've had a few offers recently for sponsored posts that I've actually thought about for a minute or two though. I've seen so many blogs with WAY too many ads on them - they are a pet hate of mine too - and also seen WAY too many posts about the same subject all at once when you know it would be from a sponsor. Hi Donna - I always love it when you come to visit - you have so many comments on your blog that it's hard to find a spot to leave one! And I think you'd do great Vision Boards because your blog is such a visual one so I assume you're really visually oriented too. I tried to do one a few years ago and interestingly some of the stuff I'd put on there I'm pursuing - well, the Italian holiday comes to mind. When I added a pic of Tuscany (mine was a secret virtual one in Pinterest) I didn't think I'd be getting there any time soon! So, yay! Of course some of the other things - pursuing writing etc hasn't come to fruition. Yet! This may be a one-off for me too Deb - although I like the concept of just picking random pictures out of a magazine that appeal to me and then extrapolating what my subconscious might be trying to tell me. It might still happen and there's still time for you to fulfill a few more of yours. 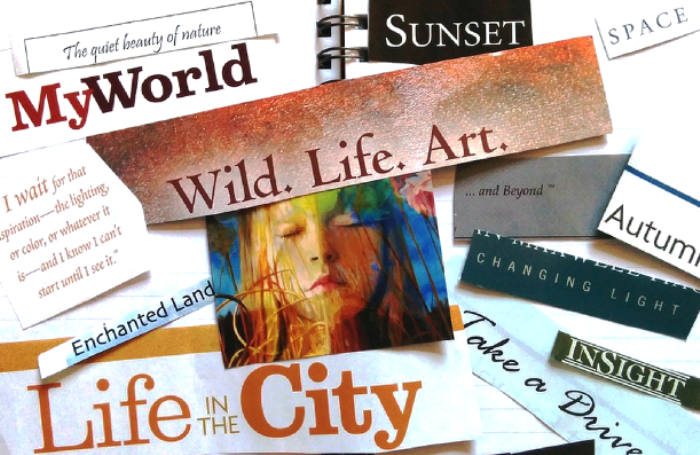 I used to have a vision board - just a powerpoint presentation - but for a long time I haven't reated or looked at one. Your post has inspired me to make one again. I hadn't thought of doing it in a Power Point format Suzy - that adds another dimension to the whole process - and might sharpen my PP skills! Thanks for the shout out Leanne. I'm glad you dove into the Vision Board "craze" with the rest of us. I loved how you created your Vision Board, because you didn't have magazines. The key to a good Vision Board is to find what works best for you, not for me. You're right Jennifer - the idea of magazines and trying to find pictures to match my vision was a little daunting. Doing it online with the wealth of images and the magic of a Search function made the whole process a lot more do-able for me. Nice work on the boards Leanne. I love the memory one. So much interest here we will feature this in the next Pit Stop.